Over the past few months I have been aware of my CSB slowly failing, whirring noises that increased with speed, strange vibrations, etc. However, this past week the bearing failed in a spectacular fashion. I can only assume the bearing finally seized up after me neglecting this repair for so long, and to be honest I probably needed that wake up call. Imagine that all 4 of your wheels are square instead of round. That's what it felt like until the bearing would let loose for a bit and allow me to drive above 20mph, and then randomly it would keep doing that over and over again. Luckily I had anticipated this failure and had a brand new Spicer CSB sitting in my ML, thanks to a link 43sqd posted here about a great deal on the OEM piece of kit. So, I jacked up my ML and proceeded to attempt to replace the bearing. I have heard nightmares about the two 16mm bolts holding the bearing to the frame. Therefore I hit these two bolts with an obscene amount of PB blaster and liquid wrench before doing anything. I then proceeded to remove the 6 6mm hex bolts holding the driveshaft to the transfer case, lifting and lowering the back of the car to be able to rotate the driveshaft and have it stay put so that I could remove the bolts. I now went for the 2 dreaded drive shaft bolts. My heart sank when I realized how poor access was to these two bolts which surely required a lot of torque to crack loose. Somehow, I managed to find a 3/8's ratchet which was just short enough to allow me sufficient movement, but also just long enough to get some real torque down on the bolts. After 15 minutes of fiddling and trying on different sockets and positions one of them finally broke loose. I honestly couldn't believe it. I then went for #2 , and with a push of force, it too, broke lose. I knew I was practically in the clear for the rest of the repair and indeed, this was true. I hit the 4 8mm bolts holding the intermediate shaft to the actual driveshaft and separated the U-joint holding them together. 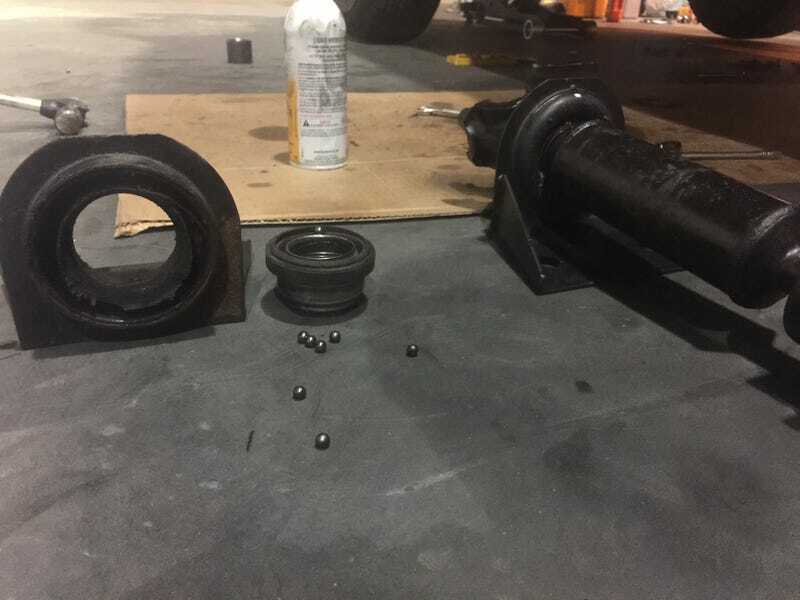 I encountered some difficultly here trying to remove the whole intermediate driveshaft and bearing so I made the decision to drop the actual driveshaft itself, which turned out to be easier than expected, just 4 16mm bolts with my electric impact wrench and both the driveshaft and intermediate driveshaft came right out. I now understood why my car was begging me to replace this part. The old CSB had completely disintegrated and as soon as I removed the 24mm nut holding the splined connection down, about a dozen ball bearings escaped from their misery at the hands of my driveshaft. I tapped the new bearing on with a large socket, trying my best to get it to where the old one was after hearing stories of vibrations because it hadn't been aligned properly. I put everything back together, and amazingly, the car was silky smooth, no noises, vibration or anything. I was so relieved that I could finally drive my ML again without fearing for it's health. Next up on my repair list, engine mounts, front shock absorbers, and fuel filter. 2 16mm bolts holding CSB down. 4 8mm bolts holding the U-joint together. 4 16mm bolts holding driveshaft to differential.